Big Leather Couch: Now You Know...D.D. Do you know what the following albums have in common? (OK, this is a long list...but it illustrates our point). What the above represents is the discography of one Mr. Donald "Duck" Dunn. Every one of those albums carry a credit line for Mr. Dunn on one or more songs. Mr. Dunn was born in 1941 in a place called Memphis, Tennessee. Dunn's dad was a candy-maker and was of the opinion that going into the music business meant doing drugs and dying young. Mr. Dunn taught himself to play by listening to records and always felt he would be good at the bass guitar. His dad gave him his nickname early in life one day as they watched a Donald Duck cartoon together. Even some of Mr. Dunn's teachers called him Duck! He and Cropper formed their first band, "The Royal Spades", playing Jerry Lee, Bo Diddley and Chuck Berry covers. They were one of the first white bands to play Soul and Rhythm and Blues in the Memphis area. The band morphed into the Mar-Kays and had a hit "Last Night" before Crooper left to be a session guitarist at the great Stax Label. A short time later Mr. Dunn, at Cooper's urging joined the house band at Stax. This group of musicians performed live as a little band called "Booker T. and the MGs"
On his blog, Mr. Dunn speaks of the bass guitars he has owned in a reverential way, he still owns the first Fender Bass he bought in 1958. In 1967, Mr. Dunn traveled with Otis Redding to England for a series of concerts, and was taken back by the great reaction the bands received there. Prior to his going on tour the group at Stax would try and achieve the sound that was coming from Motown. Over time, he and many others, including myself, believe it certainly does. Remember, during this time, in the Memphis area you had Stax and Sun Records both cranking out hits along with Motown out of Detroit. All three had incredible house bands. As the bands became so comfortable playing together they each created a "sound" special to their label. Famous riffs and song rhythms were born out of jam sessions and allowing songs to flow at the end, people taking a chance or changing a rhythm and letting something new evolve. mr. Dunn was a part of the legendary recording session for Jerry Lee Lewis' album, "Southern Roots" in 1974. The four day session ran rampant with drugs and alcohol and people passing out on the studio floor. Through it all, Mr. Dunn says that "When A Man Loves A Woman" was done in one take and calls Lewis, "...outrageous, but I think he is the best rock and roller that ever lived." The MGs continued to put out music with some hits through the 70's until Booker left Memphis. He had decided to move to California. Steve Jackson and Mr. Dunn worked to keep the MGs together, but it was not to be. Jackson was killed by an intruder to his home in 1975. In 1980, mr. Dunn, along with Crooper were asked to appear in "The Blues Brothers Movie"
We had a band powerful enough to turn goat piss into gasoline." Mr. Dunn is third from left. 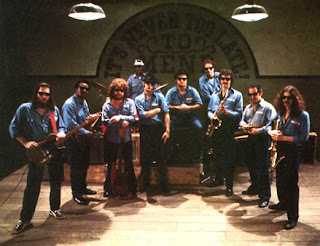 Mr. Dunn has continued playing with Booker T. and the MGs since they began doing shows again in 1977, as well as playing in the Blues Brothers Rock and Roll Revue, while continuing to work on albums for other artists. In 2007 Mr. Dunn and Booker T. & the MGs members Lewie Steinberg, Booker T. Jones, Steve Cropper, and wife of deceased member Al Jackson - Barbara, were awarded a Lifetime Achievement Grammy during a Special Merit Awards Ceremony in Los Angeles. Mr. Dunn is also an inductee in the "Rock And Roll Hall Of Fame", along with his Booker T. and the MGs band mates, having been inducted in 1992. "Top Of The Stax - Twenty Greatest Hits"